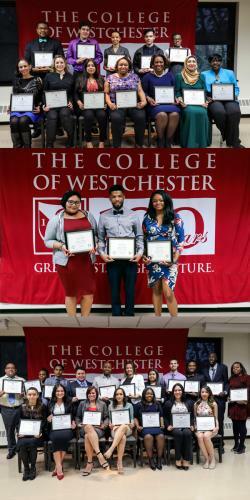 CW honored and inducted 24 students from Phi Theta Kappa, 18 students from Sigma Beta Delta, and 7 students from the CW BBA Honors Program during yesterday’s Spring Honors Induction Ceremony. Opening remarks included Dr. Warren Rosenberg, Provost and Vice President of Academic Affairs, and Dr. Judith Lilleston, Associate Dean, Student Success. “Education changes everything. And catching a break. Everyone needs a break, especially these days, and every little bit helps. 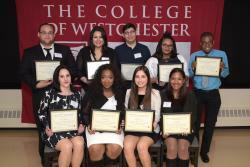 As I am proud of my own family, I am so very proud of each of our College of Westchester scholars here today, and proud of their families and their teachers as well. Tonight you are all getting your well-deserved Break-through,” said Beverly Tramontelli, President of the CW Charitable Foundation.